Pastor Newton K. Trimmer was born in Sparta Wisconsin, to Newton S. and Ruth A. Trimmer. He is the youngest of three children. Today, his oldest sister lives near Dayton, Ohio and the middle sibling lives in Oxford, Wisconsin. Pastor Trimmer graduated from Portage High School in Portage, Wisconsin, in 1977. After high school, he attended Madison Area Technical College to study Diesel Mechanics. In 1978 he began his 17 years of employment at the Wisconsin Power and Light Company, he obtained Journeyman Certifications in industrial welding and large machine repair, residential HVAC service, and major appliance repair and delivery. Ending his first career as a Service Training Specialist in 1995, he began his education to prepare him for his 2nd career as a minister of the Gospel. He graduated from Martin Luther College in New Ulm, Minnesota in May of 1998. After receiving a Masters in Divinity from Wisconsin Lutheran Seminary in May 2002, he was assigned to serve two churches; one in Valley City and the other in Jamestown, North Dakota. Pastor Trimmer is married to Karen Ashley (Trimmer). Karen attended high school in Fall River, Wisconsin, and graduated from Madison Area Technical College with an Associate’s Degree in Computer Programming. While her husband was attending the Seminary, She worked in the WELS IT department in Milwaukee, Wisconsin. Karen has also been involved in refereeing volleyball and basketball for 30 years and continues to do so in the Maryland area. 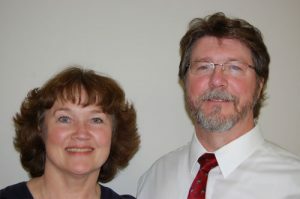 Pastor Trimmer and Karen have three children and five grandchild. The oldest of the three children is Aaron. He is married to Jennifer. Both Aaron and Jennifer are teachers at St. Paul’s, a WELS grade school in Columbus, Ohio. Noah, their second child, is married to Brittany, they have three children and live in Yale, MI. Noah continues to pursue his college education in vocal music, mathematics, and computer technology. His wife, Brittany, teaches grades 1-8 at Emmanuel Redeemer, a WELS school in Yale, MI. Rachel is the youngest. She graduated from MLC with a degree in both vocal and instrumental music. She is married to Jacob Brohn. Jacob is seeking to obtain a Masters of Divinity at Wisconsin Lutheran Seminary. The Lord has and continues to bless Pastor, Karen and their children!